How do the first five scenes of 'Macbeth' achieve the following:- provoking the audience's interest- introducing a world of perverted values- establishing an atmosphere of strangeness and evil- and introducing the main characters in the drama? How do the first five scenes of 'Macbeth' achieve the following: - provoking the audience's interest - introducing a world of perverted values - establishing an atmosphere of strangeness and evil - and introducing the main characters in the drama? 'Fair is foul and foul is fair' are seven of the most important words in William Shakespeare's shortest and bloodiest tragedy. 'Macbeth' tells the story of a heroic Scottish general, Macbeth, who hears a prophecy from a trio of witches that one day he will become king of Scotland. Consumed with ambitious thoughts and spurred to action by his wife, Macbeth murders King Duncan and seizes the throne for himself. He begins his reign wracked with guilt and fear and soon becomes a tyrannical ruler, as he is forced to commit more and more murders to protect himself from being suspected of King Duncan's murder. In the first five scenes of 'Macbeth', the audience's interest is captured, the main characters are established and many of the main themes are introduced by the combination of diction, imagery, stage action and incident. 'Macbeth' opens with a dramatic entrance from the witches, which alone would appeal to the audience but also immediately sets a sinister atmosphere for the entire play and introduces the supernatural theme that runs significantly throughout. ...read more. The action begins and ends with a pair of bloody battles. In the first, Macbeth defeats the invaders in which the sergeant states that, 'Brave Macbeth, - well he deserves that name' cut off MacDonwald's head and 'fix'd it upon our battlements'. Irony is a key factor here, as later in the play in the final battle Macbeth himself is slain and beheaded by Macduff. Without knowing this, our initial impression of Macbeth is that of a brave and capable warrior. This perspective is complicated, however, when we hear him utter the words, 'So foul and fair a day I have not seen.' This undeniable link between Macbeth and the three witches would intrigue the audience into wondering what possible connections there could be between the highly regarded brave soldier that is Macbeth, and the 'weird sisters' who were only recently gleefully plotting the torture of a helpless sailor. This link would keep the audience enthralled when Macbeth first meets the witches and when we see Macbeth interact with them. We realise that his physical courage is joined by a consuming ambition and a tendency to self-doubt, as the prediction that he will be king brings him joy, but it also creates inner turmoil. This torn state in which he is in is displayed in his scene with Banquo, Angus and Ross. ...read more. These witches are also extremely sadistic and live in a supernatural world of perverted values where disorder controls its inhabitants. However, it is not solely the witches who introduce this world, but also the unquestionable link between them and the Macbeths. Lady Macbeth's cruel character is presented to us, and the audience's attention is captured due to the disturbing nature in which she relentlessly persuades Macbeth into committing murder without any thought for morals, or right or wrong. This frightening character would captivate the audience's concentration, as not only is Lady Macbeth a woman, but she is a human being who appears to have entered the witches' world of twisted ideas without a care in the world. Macbeth, is introduced as a brave soldier, but his character appears to transform into a greedy, yet cowardly man who is hungry for power. Also provoking the audience's interest is the questions relating to the characters. Are the witches here to play with people's minds or are they merely foreseers of the future? Would humans be capable of carrying out such evil without a persuasion? These questions are eerie and unanswered, adding to the atmosphere which this tragedy conveys. In conclusion, these first five scenes are merely a taster to the rest of 'Macbeth', but already Shakespeare has achieved provoking the audience's interest, introducing a world of perverted values, establishing a powerful atmosphere of strangeness and evil and introducing the main characters. ...read more. 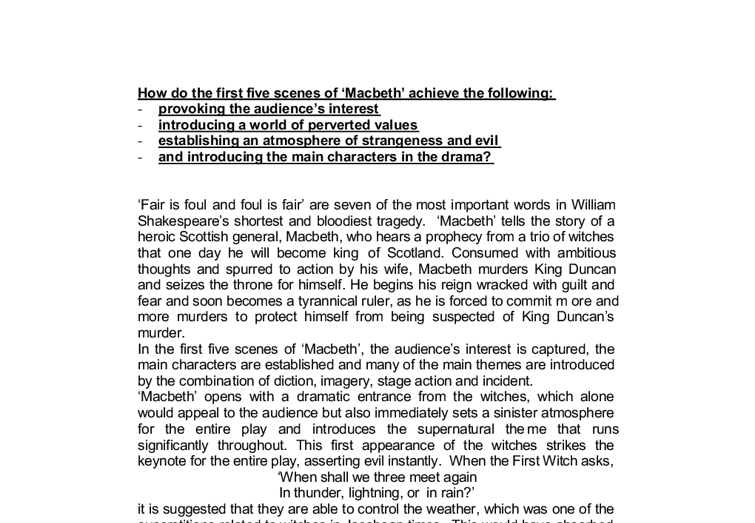 This student written piece of work is one of many that can be found in our GCSE Macbeth section. How does Shakespeare create dramatic tension in these scenes? The language is showing exaggerated amounts; he feels as if all of the water in the world cannot wash the stain of blood. His hands will turn all of the seas red with guilt, proven by the statement "multitudinous seas incarnadine". He works as Macbeth's dramatic foil, even though he and the central character are such great friends, he is the complete opposite to his ally. He has a relatively strong resolve and is not easily fazed and symbolises what the thane of Cwardor left behind. 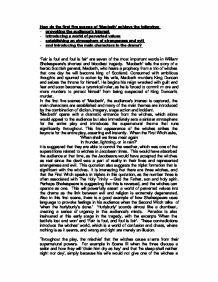 in the play, as we must remember that the witches are the first but not the last supernatural influence Macbeth experiences. Banquo's absence from the scene could have still allowed the play to complete its full course and elaborate in exactly the right places. How does Shakespeare use Characters and Language to Discuss evil in his Play &amp;quot;Macbeth&amp;quot;? He then uses the phrase "from the nave to the chaps" to explain Macbeth's vile cutting action. This gives the reader the idea that he cut him from top to bottom severely and considering no amount of dignity or respect for this person. him and seems to feel that actual danger is less frightening than the thoughts that now lie within his head. This can be taken to mean that at this time he does not actually mean to take the life of the king and is merely speculating upon the events that would proceed the untimely death of the king. Witches are shown as evil in Macbeth because they lead Macbeth off and caused everything that happened in the story, right down to his death. Shakespeare probably included this scene to show that only something evil like a witch could make Macbeth's life turn like this. What does the supernatural contribute to the interest of &amp;amp;#145;Macbeth&amp;amp;#146;? were mocking him, the witches could have power over him or Shakespeare is suggesting that Macbeth and the witches are similar in character as well as in speech. I think that their similarity in speech reflects their similarity in character and reveals that Macbeth has an evil flaw within himself.